Branch Managers ensure that the branch operations and workings are efficiently carried out. Essential duties mentioned in the Branch Manager description template are – directing operational aspects, managing all the branch operations, assessing local market conditions, developing forecasts, meeting goals, managing budgets, coaching and motivating employees, locating areas of improvement, addressing customer issues, networking with vendors and suppliers, streamlining branch operation procedures and policies, and leveraging growth opportunities. 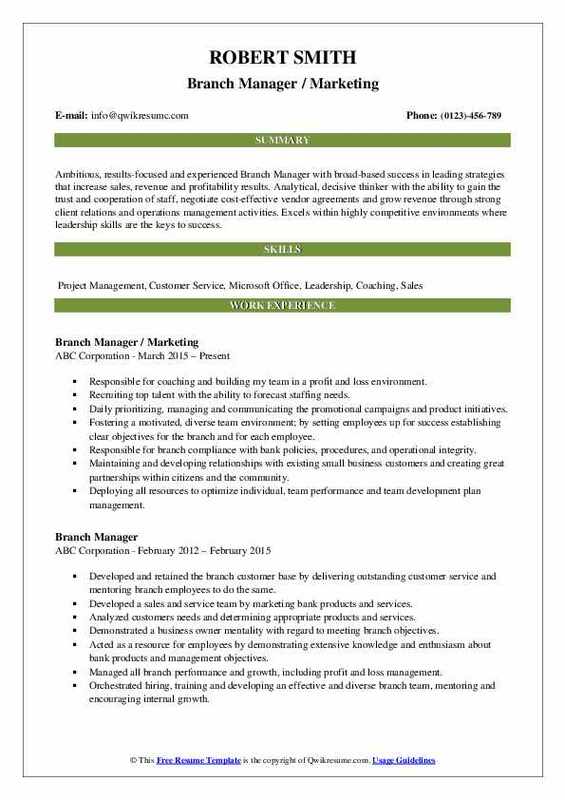 Typically these professionals are expected to demonstrate on their Branch Manager Resume skills such as – proven work experience, sufficient knowledge about modern management techniques, and success record of overcrossing sales target, familiarity with industry rules and regulations and customer-focused approach. Successful resumes should depict a degree in business administration or accounting or finance. 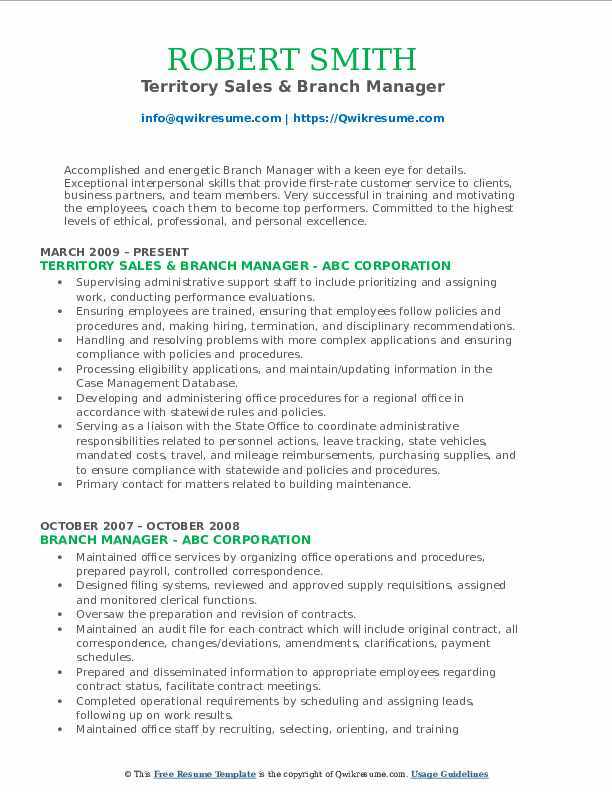 Summary : Ambitious, results-focused and experienced Branch Manager with broad-based success in leading strategies that increase sales, revenue and profitability results. Analytical, decisive thinker with the ability to gain the trust and cooperation of staff, negotiate cost-effective vendor agreements and grow revenue through strong client relations and operations management activities. Excels within highly competitive environments where leadership skills are the keys to success. Responsible for coaching and building my team in a profit and loss environment. Recruiting top talent with the ability to forecast staffing needs. Daily prioritizing, managing and communicating the promotional campaigns and product initiatives. Fostering a motivated, diverse team environment; by setting employees up for success establishing clear objectives for the branch and for each employee. Responsible for branch compliance with bank policies, procedures, and operational integrity. Maintaining and developing relationships with existing small business customers and creating great partnerships within citizens and the community. Deploying all resources to optimize individual, team performance and team development plan management. Managing a high performing team: showing accountability by taking ownership of the business and willingness to make customer-focused decisions when needed. Providing sales leadership to ensure franchise growth: leading by example, through accountability, reward, and recognition to drive outstanding sales and service results. Ensuring that customers are extremely satisfied with every interaction. Summary : Ambitious Branch Manager with 8 years of successfully covering a large geographical territory, while delivering superior client services and business development. Possesses practical knowledge in inside and outside sales and marketing. Applies effective communication skills to deliver sales proposals and presentations to decision makers and clients. Operates with a strong sense of urgency and thrives in any setting, or circumstance. Leading, coaching and executing a proactive client experience within an omnichannel environment. Coaching team to effectively provide solutions and advice to improve client financial well-being. Managing operational, human capital, reputational and business risk through adherence to established policies and procedures. Exercising sound decision making to identify and mitigate potential risk. Leading, planning, and executing branded sales process to achieve or exceed proforma expectations. Growing branch revenue through the acquisition and share-of-wallet growth of consumer and business households as well as through collaborative partnerships with eco-partners. Driving business banking results primarily through business development and community involvement activities. Acquiring and retaining talent through the coaching and development of employees. Leading the performance management process for all direct reports and may manage a manager(s). 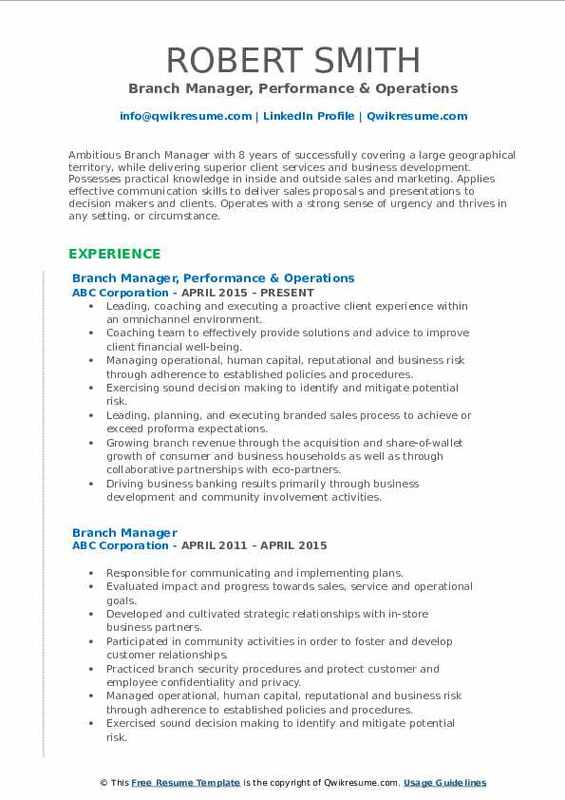 Summary : Accomplished and energetic Branch Manager with a keen eye for details. Exceptional interpersonal skills that provide first-rate customer service to clients, business partners, and team members. Very successful in training and motivating the employees, coach them to become top performers. Committed to the highest levels of ethical, professional, and personal excellence. Supervising administrative support staff to include prioritizing and assigning work, conducting performance evaluations. Ensuring employees are trained, ensuring that employees follow policies and procedures and, making hiring, termination, and disciplinary recommendations. Handling and resolving problems with more complex applications and ensuring compliance with policies and procedures. Processing eligibility applications, and maintain/updating information in the Case Management Database. Developing and administering office procedures for a regional office in accordance with statewide rules and policies. Serving as a liaison with the State Office to coordinate administrative responsibilities related to personnel actions, leave tracking, state vehicles, mandated costs, travel, and mileage reimbursements, purchasing supplies, and to ensure compliance with statewide and policies and procedures. Primary contact for matters related to building maintenance.